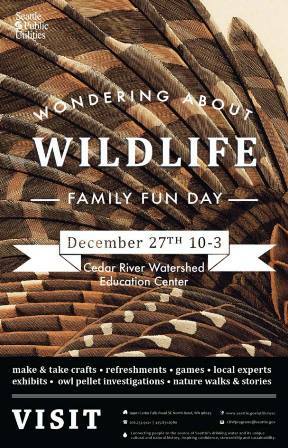 On Friday, December 27 from 10 AM to 3 PM families are invited to bring children for the Wondering About Wildlife Family Fun Day at the Cedar River Watershed Education Center. The Center is located at 19901 Cedar Falls Road SE, North Bend, WA 98045, about 43 miles east of Seattle. The Wondering About Wildlife Day will include a choice of indoor or outdoor activities. There will be crafts, game and stories indoors, interaction with wildlife experts and owl pellet investigations to find out what exactly the owl ate. Outdoors you may go on nature walks and learn about the wildlife of the watershed, and about where Seattle’s drinking water comes from. Take a “virtual tour” of the Cedar River Watershed at this link.